Author: Simon, Alvah Set In . . . 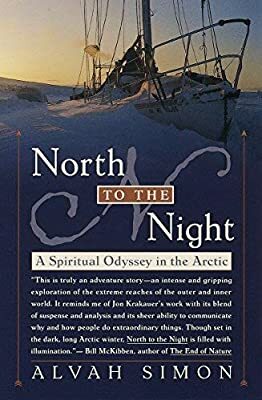 Description: In June of 1994 Alvah Simon and his wife, Diana, set off in their 36-foot sailboat to explore the hauntingly beautiful world of icebergs, tundra, and fjords lying high above the Arctic Circle. Four months later, unexpected events would trap Simon alone on his boat, frozen in ice 100 miles from the nearest settlement, with the long polar night stretching into darkness for months to come. With his world circumscribed by screaming blizzards and marauding polar bears and his only companion a kittten named Halifax, Simon withstands months of crushing loneliness, sudden blindness, and private demons. Trapped in a boat buried beneath the drifting snow, he struggles through the perpertual darkness toward a spiritual awakening and an understanding of the forces that conspired to bring him there. He emerges five months later a transformed man. Simon's powerful, triumphant story combines the suspense of "Into Thin Air" with a crystalline, lyrical prose to explore the hypnotic draw of one of the earth's deepest and most dangerous wildernesses.